Desiree sets sail for Antigua to pose in another floor length technicolor dreamcoat set aboard a sailboat, cresting in the choppy sea. There's two hours to fill so instead of jumping into dates, Desiree rehashes her relationship with all three guys. I ignore. Drew, who claims he's never heard of Antigua, is the first date of the week and they drive around the island in a red jeep (guess they returned the 60s fridge colored Bentley). They arrive in town to a festival of steel drums, poor dancing by the pair, palm weaving, and LIMBO! The dullards have a picnic with a view and after another boring conversation they kiss to save us the torture. Drew's fun to look at, but my god he might be one of the worst contestant's to recap a date of ever. Rain washes out the romantic dinner plans so they get right to the fantasy suite portion. He accepts the card, they talk all boring again about wanting lasting love, he loves her so much, zzzz, slurp. Hit it and quit it, girl. He's boring. 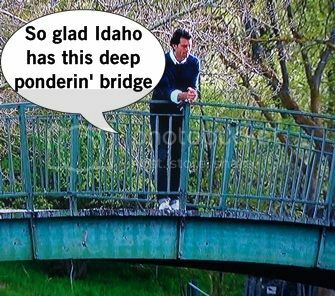 Brooks, chillin' in Idaho, is having a bit of a conundrum. He's not sure why he can't say I love you so he's seeking the consult on his mother and sister. Brooks doesn't want to propose if he's not fully 100% in love which for most people takes more than two months yet America scorns him for this. Time to do the right thing and be honest. Of course there's never the idea of maybe we should just continue dating and not necessarily get engaged next week. Chris pulls up in a black jeep for some car rental variety, briefly greeting Des before the pair are escorted away by helicopter. HELICOPTER!! About GD time as we've only had on chopper this season and it was depressing. They strip down to their swimmies and sip mixed drinks, chat about the family meeting, and then makeout on the beach with the waves cascading atop them. Night falls and another private romantic dinner is prepared, so there's an overwhelming sense of dread that a poem is coming. Chris spent his downtime hunting down jobs in Seattle as a place for them to start a life together, but she seems to prefer the idea of staying in California. Because she wants to be famous. But she says she'd be open to it (ehh kinda lying). Chris accepts the fantasy suite card to watch the stars together, "no expectations." But we know there's one thing to expect: A POEM. Cue a musical encore of some past due and some smooching. Desiree is giddy for her date with Brooks, blissfully unaware that he's gonna crush her soul in minutes. 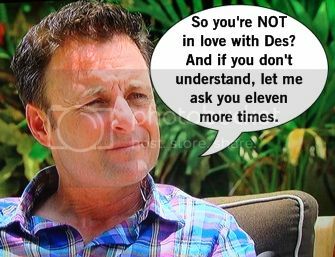 And so after two other times of hearing Brooks explain what it's like to not be in love with Des, we endure it again in the sad breakup way. On paper she's his ideal gal, but the separation between dates makes him forget the magic. He wants to be in love with Des, but he isn't. Cue her crying, sobbing, heartbroken. She keeps asking more questions that seem to just be more kicks in the stomach like he doesn't see it lasting after. When Des says she loves him he asks why she didn't say that before. "Because I can't!" she says, because clearly the dude doesn't understand the mystery of TV and that you can't reveal that one guys is probably going to win before the end. She's totally crushed and it painfully goes on way too long. "I didn't want to share my heart, I wanted to give it to you," she cries. So yup, she's basically just got through the motions (and makeouts) to get to the end with Brooks. DE-PRESSING. And the week ends with Des sobbing on a dock and Brooks all red-faced crying in a forest. I think I need a glass of wine as much as they do. Desiree knows that while there's two guys that love her, she can't love them back the way she knows she can love. So this is about to get more awkward.